For the most part, I find that Visual Studio 2015 is awesome. However, it did ship with kinks that need to be worked out. Not least, it has crashed on me from time to time, while working on a large solution. That is some talent, right there. That must have taken a lot of work to get this right. After trying various things, and having researched this without success for a few hours, I finally got the idea to try opening the projects in Visual Studio 2013, instead. Behold: VS 2013 actually displayed a useful error, which informed me that my projects had Import dependencies that I forgot to move. So, yeah. 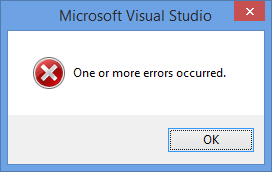 If VS 2015 helpfully tells you that "one or more errors occurred"  try VS 2013. Thanks for this. I got the same extremely unhelpful error and was also able to fix it by opening the project in VS2013. For me the cause was different: a set of build customizations that was installed in VS2013 but not VS2015 (found under Build Dependencies -> Build Customizations in the project menu). This caused the project to open without issue in VS2013 but not in 2015. I fixed the problem by copying the associated .targets, .props, and .xml files for the build customization from C:\Program Files (x86)\MSBuild\Microsoft.Cpp\v4.0\V120\BuildCustomizations to the corresponding V140 version of the folder. Hope this helps for anyone else who gets this error. Thanks for this tip - mine turned out to be a missing User.props file. I too bumped into same issue when opened the solution from VS 2015 and as you mentioned, got more details when I opened the solution from VS 2013. Thank you for your tip.